Drizzled with a tahini icing as soon as they come out of the oven, the buns are fudgy, rich and bursting with flavor. They’re as decadent as possible–but not too overpowering that you won’t want more than one–and I love that these are the sort of treat that works for both dessert and coffee time. (Side note: is coffee time a thing? Yes? No? It should be.) These buns have a lot going on, but it just works. Even non-halva lovers will get in on the action, finding the combination of sesame and chocolate deliciously alluring. 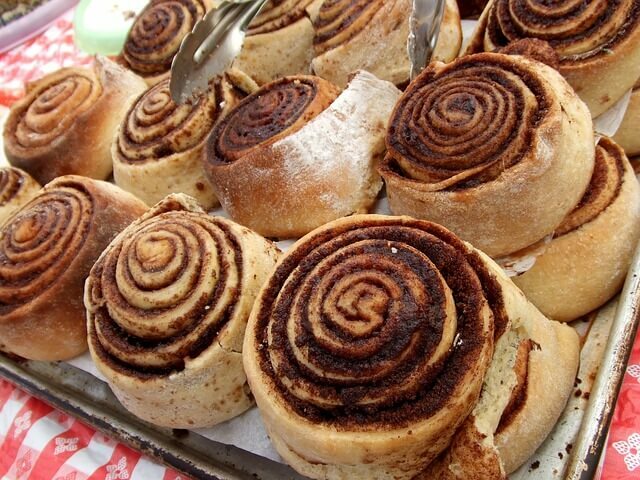 But then again, who can resist the siren call of a bun? Yell “I got buns, hun!” and you’ll have everyone lined up, ready to taste these for themselves. The Jewish ceremonial bread, challah, is a glossy, stretchy, braided bread. Challah is similar to brioche and therefore can be used in breakfast dishes like other enriched breads. The dairy-free bread goes well with coffee or tea and the bread is less rich than cinnamon rolls.